Life Before the Dinosaurs: Pambdelurion. Pamdelurion was an eyeless, crawling bottom-dweller with eleven pairs of lobe-like swimmers and eleven pairs of lobopod-like legs. It probably usually crawled on the sea floor. Since it had swimmers, it also swam. 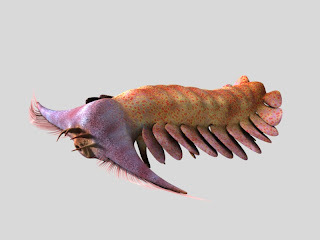 Pamdelurion had two claws with hair-like spines in the front of its head. When it was hunting it pulled the claws backwards, and then reached them out to grab prey. It probably ate a variety of things. It had a circular mouth under its head, just like most of the other dinocarids. This weird creature was probably a relative of Kerygmachela. I need a t-shirt with that last diagram on it. I have a t-shirt with Pambdelurion whittingtoni from the bottom view, just like you like it. 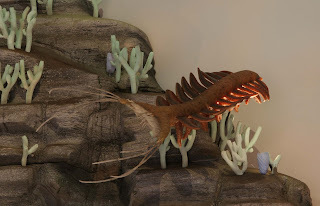 It also has Kerygmachela kierkegaardi, Schinderhannes bartelsi, Anomalacaris canadensis, Amplectobelua symbrachiata, Hurdia victoria, Opabinia regalis, and Laggania cambria. I collected these guys this summer. If you send me an email I will send you a picture of one of the fossils I collected. I can also send you a picture of Kerygmachela. Cool! You can email my mom at contact@lifebeforethedinosaurs.com and she'll show me the pictures! !